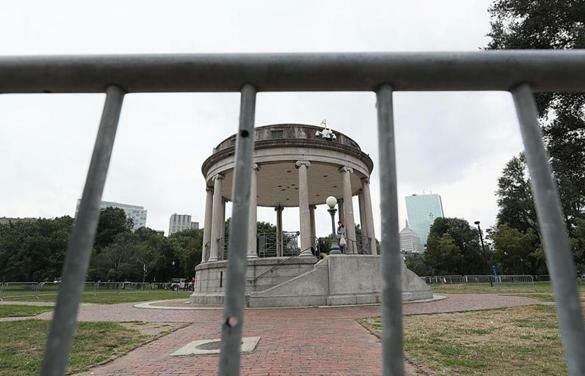 Barricades are set up surrounding the bandstand on the Boston Common in advance of the weekend rally. 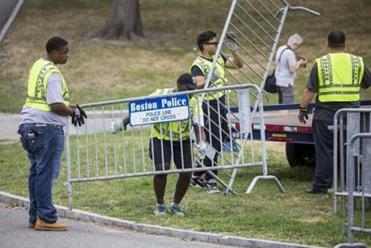 The city plans to dispatch more than 500 police officers to patrol Saturday’s “Boston Free Speech” rally on Boston Common Saturday, and city officials vowed to shut it down if it turns violent, as they prepared for what is one of the first big demonstrations since the violence in Charlottesville, Va., last week. Authorities fear white supremacists will attend, and two of the rally’s keynote speakers have ties to extremist elements — including one who attended the Charlottesville rally. Rally organizers have maintained the event is open to all political views and not a forum for hate groups, and the permit issued by the city is for only 100 people. But tens of thousands of counterprotesters are expected to show up to denounce racism and anti-Semitism. The heightened concern comes in the aftermath of the Charlottesville rally, where one counterprotester was killed and dozens of people were injured. The violent rally prompted a series of remarks by President Trump that were widely denounced as divisive. He urged the public not to confront members of hate groups who show up Saturday and advised residents and tourists to avoid the Common during the rally. Evans said several streets around the Common will be closed during the rally, and cameras have been installed in and around the bandstand. Some officers will carry cameras as well. Evans said his department has ample experience with crowd control, including during the Occupy Boston encampment, Black Lives Matter marches, and sports team championship parades. But, he said the rhetoric he’s heard leading up to Saturday is concerning. Two of the keynote speakers scheduled to address the rally are Kyle Chapman and Joe Biggs. Biggs, a former Army staff sergeant, worked until recently for Infowars, a website founded by Alex Jones, the notorious conspiracy theorist. Police will seek to keep the rally-goers and the much larger group of counterprotesters separated on Saturday, using officers and barricades between the groups. One group is planning to march from Roxbury to the opposite end of the Common from the rally. Cannon said demonstrators plan to meet in front of the Reggie Lewis Track and Athletic Center in Roxbury at 10 a.m. for the “Fight Supremacy! Boston Counter-Protest & Resistance Rally”. Then they are expected to march down Tremont Street to the Common, at the corner of Beacon and Charles streets. “We plan to send a really strong message that . . . you don’t get to come here and do this,” Cannon said. To prepare for the march, dozens of people gathered in the basement of the Union United Methodist Church on Columbus Avenue on Friday for an hours-long training in “nonviolent direct action.” The session was taught by Black Lives Matter activists from Washington, D.C., and activists from New Jersey and Baltimore. It was organized by clergy and activists in Boston. Participants acted out hypothetical hostile situations. Afterward, they discussed how their actions either escalated or deescalated the situation. Prema Bangera, 31, of Brighton, played the role of a counterprotester who faced raucous “Free Speech” protesters and police. Reverend William B. McClain, senior pastor of the Union United Methodist Church, also participated in the antiviolence training with his wife, Jo Ann, though he was no stranger to facing hate. In September 1963, McClain said, he and another reverend were viciously beaten in Anniston, Ala., when they tried to integrate a library. After the first black president was elected, McClain said, he thought the country was moving in the right direction. He feels differently now. Others prepared for Saturday by attending an interfaith gathering at Temple Israel of Boston late Friday afternoon. Clergy from various faiths and public officials delivered messages of unity to the more than 1,700 people gathered on the eve of the “Boston Free Speech” rally. “What unites us is always stronger than what divides us,” said Attorney General Maura Healey. Healey, a Democrat, also criticized Trump. “Anyone who struggles to denounce white supremacy or Nazism does not deserve to be president of the United States,” she said, drawing a standing ovation. “Let’s all go forth . . . as peacemakers,” Governor Charlie Baker told the crowd. Earlier in the day, Baker said that Boston played an important role in the fight for freedom and equality and that that would continue. Mayor Martin Walsh and Governor Charlie Baker and other city and state officials held a press conference at City Hall to address public safety concerns ahead of this weekend's upcoming rally. Jan Ransom can be reached at jan.ransom@globe.com. Follow her on Twitter at @Jan_Ransom. Travis Andersen can be reached attravis.andersen@globe.com. Follow him on Twitter @TAGlobe.